It’s now a month since Week 6 of Laddership ended. We had our final Week 7 call two days ago and here’s a short write up about my journey since. If there is one word to use as I continue my ServiceSpace journey, it’s possibility. My eyes are opening up to tons of possibilities - no longer just in the theoretical sense, but an experiential sense of it. Coupled with support from all the other ladders in the circle and learning a new language to articulate these things I feel more and more armed to explore territory I've not been to before. I had to miss two calls due to meditation retreat I had planned few months back, but I caught up by sending in my reflection questionnaires early, and joined the other group's week 6 call. On my first day back from retreat, Laddership seeds started to sprout. My younger brother, Lewis, was watching YouTube videos on his laptop in the dining room. I started to chat with him, and offered a video (from the Laddership) that we could watch together - A New Story of the People. After it finished, my mum popped her head in the dining room and asked what we were doing. We invited her to join, and watched the video again. It sparked conversations about alternative forms of capital, how to change the world and whether small acts of kindness can make a difference. We then watched the positive post-it notes video that Audrey had shared in one of the circles. The next day I stuck a post-it note on Lewis’ laptop wishing him a ‘sick’ day 😃. Last Thursday was my 23rd year on this planet. After I heard Trishna share the story of Sareena's 5th birthday, where she invited her friends to create blessing bags to give to the homeless instead of traditional presents. I felt inspired to do something similar. I created a Facebook event and invited friends to spend an evening doing random acts of kindness in London. 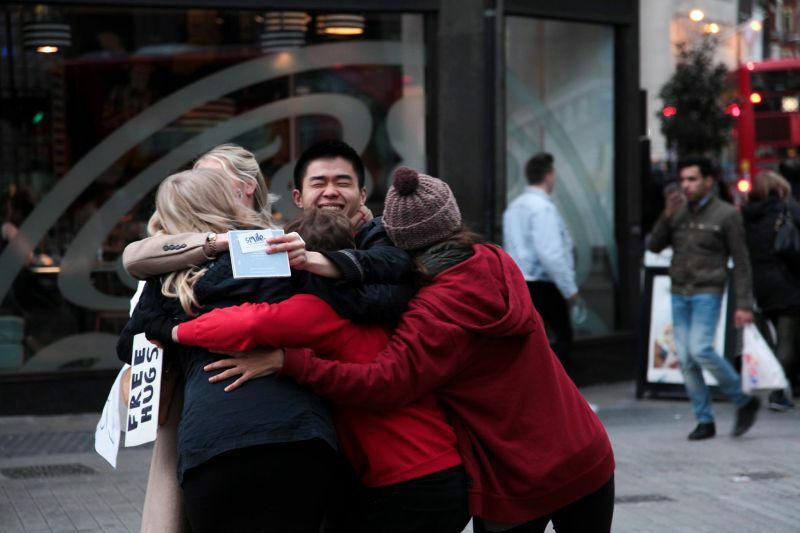 Almost twenty people show up, and we unleashed kindness onto the people of Liverpool Street in London. One highlight for me was that my mum joined us that evening too. In the video (below) that my friend, Fash, filmed and edited in record time, you can see her relentless kindness in giving out chocolates to passersby from a purple box. It was a real joy to watch. I loved the simplicity of it all. And the regenerating aspect of it - smiles bring more smiles! In the circle before we started, many of us expressed nervousness and anxiety about approaching people in public. But when we gathered again at the end, our circle had a buzz and joy to it. We'd created a field of positivity! Highlights of playing “smile chicken”- where you make eye contact with a stranger, notice they want to smile and 'play chicken' to see how long it takes for them to break into a full smile. Or “smiling so much that my cheek hurts” to noticing that the "more acts of kindness I did, the more joy I felt within me." Afterwards when we made our way to a cafe called Ziferblat, the acts of kindness just kept flowing. Hugs, smiles and gifts landing on unsuspecting people. I had one more gift I hadn’t yet given away - a small figurine that you could pin on your jacket. There was a very hip looking dude wearing a long jacket that matched perfectly with the figurine and I decided to tag him with it. He loved it! He was with two other friends, and as we parted ways they all broke out into a happy birthday song 😃. In conversations I had at Ziferblat, we spoke about a world where we do acts of kindness every day. And how these simple actions could lead us to break down the illusion of separation. We noticed that before we started the random acts of kindness, we classed the people around as “others”, but by the end of it no separation existed. What would the world looked like if we saw every person as part of our human family? A few years back, a friend shared a video series called Everything is a Remix. Inspired by those videos, and the recent Laddership, I decided to steal the format of the circle. I’m part of a private subreddit group called /r/genuinemeditation and we recently had our first virtual circle, laddership style, on Google Hangouts. We started with a minute silence, and then went round in a circle checking-in. Then we opened it up for a free-flow discussion on the benefits of meditation, and ended with a minute in gratitude. 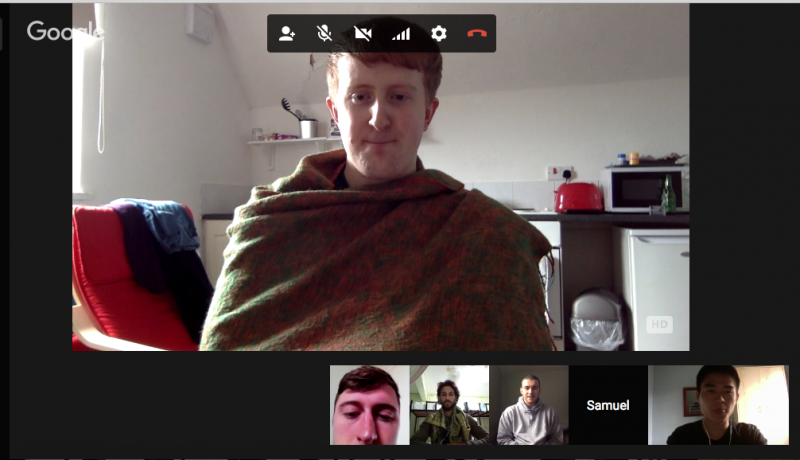 I later ran another with friends from different parts of the UK that I met at an under-25 retreat near Wales using the same format - one minute silence to begin, check-in, and a discussion on the theme of vulnerability, and a minute in gratitude to close. In the weeks post-Laddership I also tried experimenting with an Awakin’-style circle in my dining room. It can only fit about six people, so I sent out a short email invitation to neighbours and friends local to me. Four people ended up cancelling on the day, and we had a super mini three-person circle. But what’s emerging now is a six week mindfulness course through my local time bank where we’ll take turns hosting an evening each week. There's been lots of post-Laddership magic happening within the alumni too. From Shamash's biggest act of generosity, to Lynn reading Ithaca out to Zilong, to Ming expanding her Karma Circle of Wellbeing and Wisdom (and seeing her daughter Hannah on the call! ), to Wendy's protest at Dallas Zoo, to Alfred popping up on Natasha's screen for Karma Kitchen Dubai, Harpal wanting to offer her Little Book of Wisdom as a gift, to Parag's super wisdom and moving towards greater gentleness and to hearing Matt (from the other circle) being gifted a place to live rent-free. Thank you all for the work you've done in creating this space for service. And extra shoutout to the Laddership volunteers - Audrey, Natasha, Prasad, Nipun, Birju, Pranidhi, Melissa, and all the other invisible hands working their magic behind the scenes. Thank you to all my fellow ladders for being the change :-). And with the one-day Awakin retreat at Ani's place this weekend there'll be even more inward ripples of transformation! P.S: In true Laddership fashion, I get an email from Nipun, Audrey and Trishna inviting me to be a guest speaker on the Awakin' call in June. I tell them I can't refuse this amazing invitation, but oh man I feel really nervous about it!